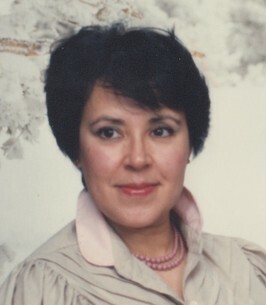 Elizabeth Quintanar Service Details - Guelph, Ontario | Gilbert MacIntyre & Son Funeral Home and Chapel Ltd. It is with great sadness that we announce the passing of Elizabeth Quintanar, in her 71st year on the morning of November 27, 2018 at Brampton Civic Hospital, with her two children Ana Smith and Adriano Senatore at her bedside. Elizabeth was a vibrant person full of faith who loved her family, life, and people from all walks of life. She will be deeply missed. She was predeceased by her son Francesco Senatore and husband Vincent Senatore. She is survived by her children Ana (Marshall) Smith and Adriano (Victoria) Senatore, as well as her five grandchildren Myah and Chiara Smith, and Audrey, Matteo and Anthony Senatore. She is also survived by her siblings and their families in Mexico. We wish to extend our gratitude to her sister Susana Quintanar, who traveled to Canada to support Elizabeth and family in this difficult time. There will be a visitation held at Gilbert MacIntyre Funeral home, Dublin Chapel 252 Dublin St. N., Guelph on Sunday December 2, 2018 from 5:00 to 7:00 p.m. A Funeral Mass will take place at the Basilica of Our Lady 28 Norfolk St., Guelph on Monday, December 3, 2018 at 10 AM, followed by her burial at St. Mary's Cemetery in Elora. Sending my love and strength to you all during this sad time. Your Mom will be truly missed.